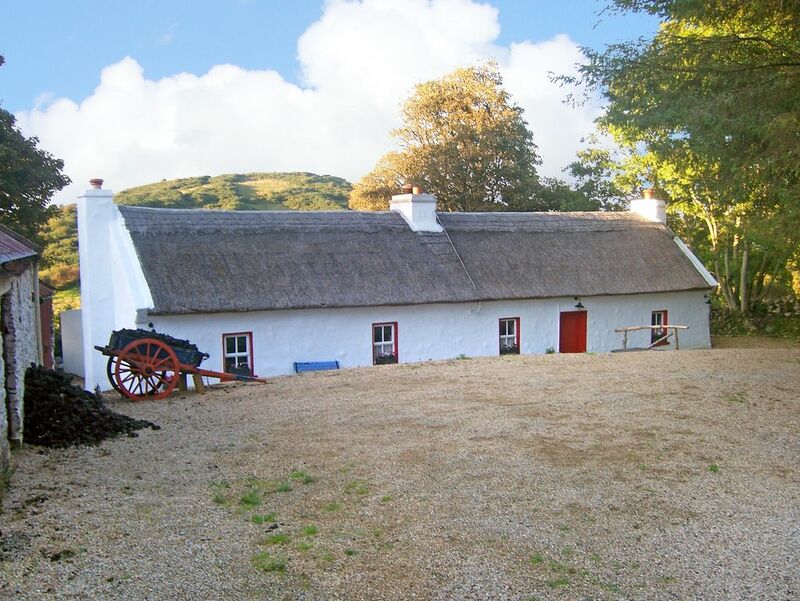 This gorgeous, 300 year old cottage has been recently refurbished and is located less than 3 miles from Ballyshannon and 12 miles from Donegal Town. Both towns are well equipped with shops, craft shops and several pubs and are in a tranquil forest setting, with terrific mountain views and nearby beaches. This cottage is tastefully furnished and full of charm and character, with all modern conveniences, 4 open fires (with coal and turf supplied) and the added bonus of electric blankets on both double beds! The area is popular for game, coarse and sea angling.Shop. Pub. Restaurant 2 miles. Beach 4 miles. GF: lounge/diner, kitchen, double (fireplace) with ensuite bathroom and separate shower, double with single (fireplace), shower room ((w/c and whb )).Electricity and oil central heating included, open fire with fuel supplied, linen and towels included, travel cot, high chair, TV, satellite tv, dvd player, CD, fridge with small ice box, microwave, w/machine, dryer, ipod docking station, hairdryer, electric blankets, fully enclosed garden, garden furniture, locked shed available for storage, private off road parking. Pets welcome. Real Gem - Terrific views - Short drive to all amenities! liebevoll eingerichtet mit stilechten Antiquitäten und Dekoartikeln aus der Zeit der Erbauung; haben das Torffeuer genossen und die Ruhe.